It is general for the young generation to transfer the data from the mobile phone. They are using the number of ways to transfer the data. 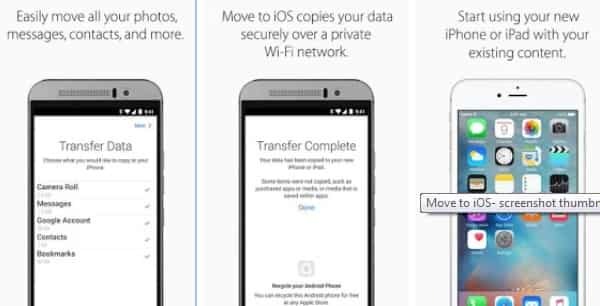 Basically, it is very easy to transfer the data from Android to iOS. When you start to transfer the data from Android to the iOS device, that was very pathetic for anybody. Now it is possible and easy with the new apps. Here you can get the details of relevant apps, which are helpful for you to transfer the data in the single click. 1. Apple iOS Apps - This app is available on the Google Play Store. You can transfer the photo, calendar, contacts, text message, and video. This app cannot transfer music or password from android to iOS. This app is available only on android 4.0, Android phone or tablets as well as can transfer data in advance android or iOS. When you choose to transfer the data, your new iPhone will create a wi-fi network and find the nearest android device running move to iOS. You have to only give the security code, they will start transfer the data and keep in right place. 2. Google App- This is another instrument to help you. If you take backup on Google app of your photo or rest data then data transfer is very easy for you. Now you can install all your Google Apps on iOS. Add your G-mail, photo, Google Chrome, and other apps. That storage will help you to search and browse - near the shop, restaurant, movie time, video, images etc. Google will help to optimize result in loading and bad connection and you will be free from all these types of head-heck. 3. Fast File Transfer - This will help to create a local wi-fi network for android device. Now login your iOS device and start to transfer the data. It is the easiest tools to transfer the big file. This apps transfer 1GB in 4 minutes. Send multiple and zip file in the single step. 4. Instashare - This app is available to transfer the data to Android and iOS both. This app is affected by Apple App airdrop features but it is capable to transfer the file from android device and can receive too. You have to drag data from the contact list and drop on it. Rest will be handled by this app. These are the best tools for you to resolve the issue in a fast manner. Please share the details and drop the comment in the below-given box.